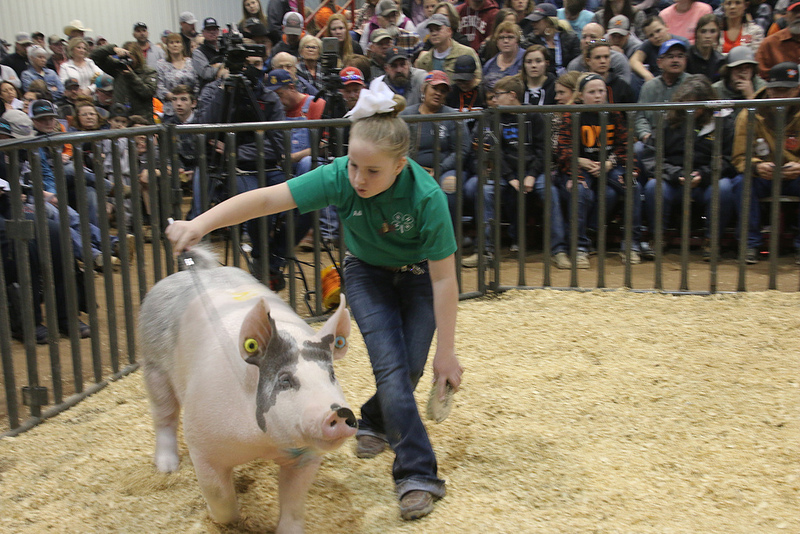 Records fell at the 2019 Oklahoma Youth Expo's Night of Stars Gilt Sale on Wednesday evening- 115 lots that came from the OYE Gilt shows at the front end of the Expo sold for $545,000- that smashes the previous record by a wide margin. And the HIGHEST selling Poland China Gilt ANYWHERE in breed history was sold in the middle of the evening. Lot 72, owned by Hadley Cooper of Amber-Pocasset FFA, was the fifth Poland gilt chosen for the sale- and she brought $40,000 for her owner. Foote Farms was the breeder of the gilt- the Pedigree shows a Nailed X Voodoo lineage. Cooper's gilt was the highest selling Poland gilt anywhere and was easily the highest selling gilt in the history of the Night of Stars Gile Sale at the Oklahoma Youth Expo. Ahead of the sale, we talked with Blake Kennedy who was responsible for adding the online element to the sale in 2018- which continued in 2019. Click or tap here to jump to that earlier story which included an interview with Blake talking about the online concept for the sale. The first gilt sold on the Internet in the 2019 sale was the Supreme Champion Purebred Gilt owned by Kade Pendley of Cyril FFA- his gilt sold for $11,000. We have added an album dedicated to our pics of the Night of Stars sale- pictures taken by both Ron Hays and Stanley Gaffrey(our OSU Ag Communications Senior helping us at OYE) are up there. Click or tap here to jump straight to that album. Our Coverage of the 2019 Oklahoma Youth Expo is once again a service of ITC Great Plains, Your Energy Superhighway- learn more about this high voltage, transmission only utility and their commitment to the communities they serve which is the cornerstone of their business-click here for their website. Reports will be heard daily on great radio stations that cover Oklahoma and that are a part of the Radio Oklahoma Ag Network- on the internet- our reports of the 2019 OYE can be found on the Blue Green Gazette page- available here. We will be adding pictures daily to our official 2019 OYE Album of Photos on FLICKR, found here. For more information about the Oklahoma Youth Expo, click here for the home page of the OYE website.